A recursive social marketing platform that gives you a LIFT in all the right places! What Is Grabbr Recursive Marketing? 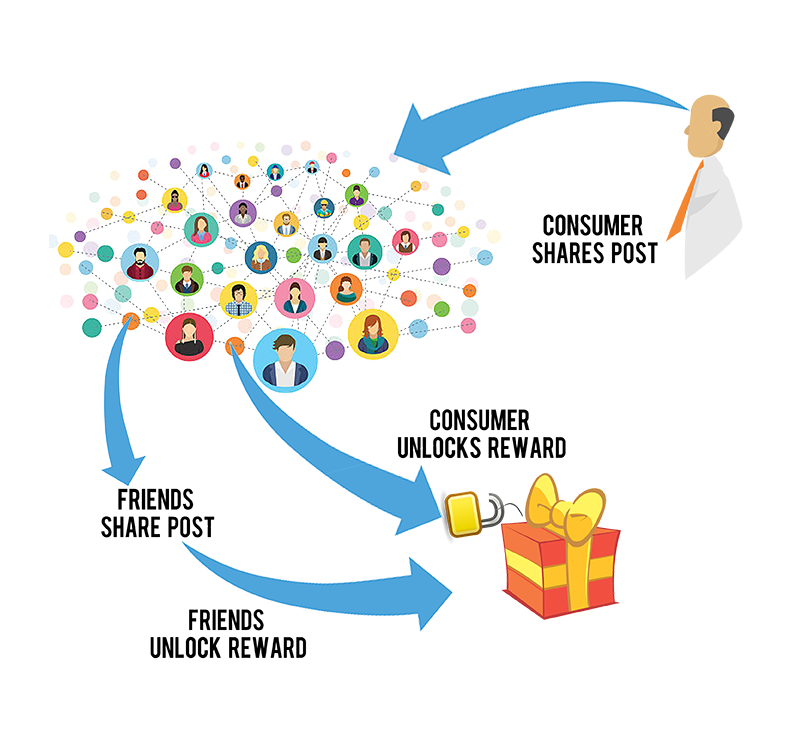 Grabbr Recursive Marketing does not push individuals to purchase products or services or become new customers. Rather, Grabbr Recursive Marketing is the art of incentivizing individuals to become marketers themselves by recursively forwarding your message or offer to their friends, followers, and connections via SMS, email, or through social networks  and encouraging and inviting those friends, followers, and connections to do the same. What Types Of Rewards Can I Offer? The Better The Reward, The More Likely Your Post Will Be Shared. 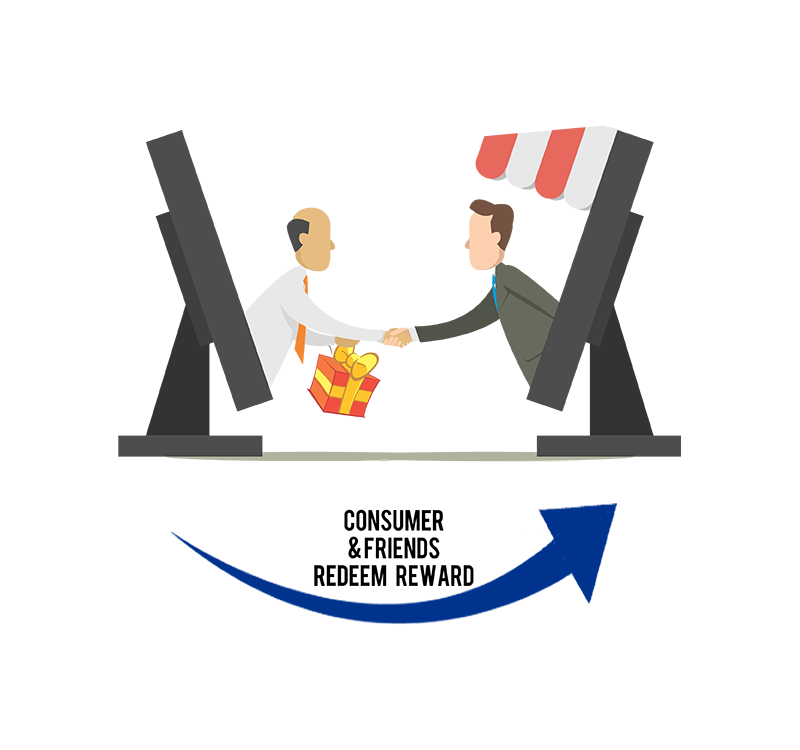 Digital rewards can be used to incentivize behaviors, drive conversions or user actions, provide recognition for accomplishments, or reward loyalty. 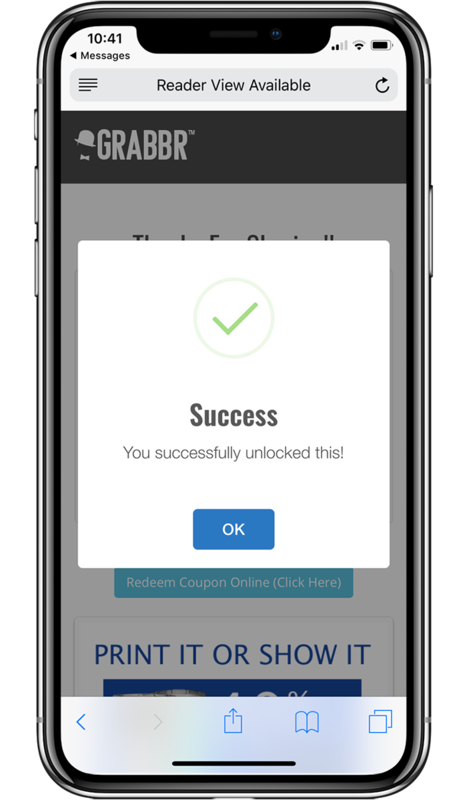 Grabbr gives you the tools you need to LOCK a Digital Reward inside your marketing post. 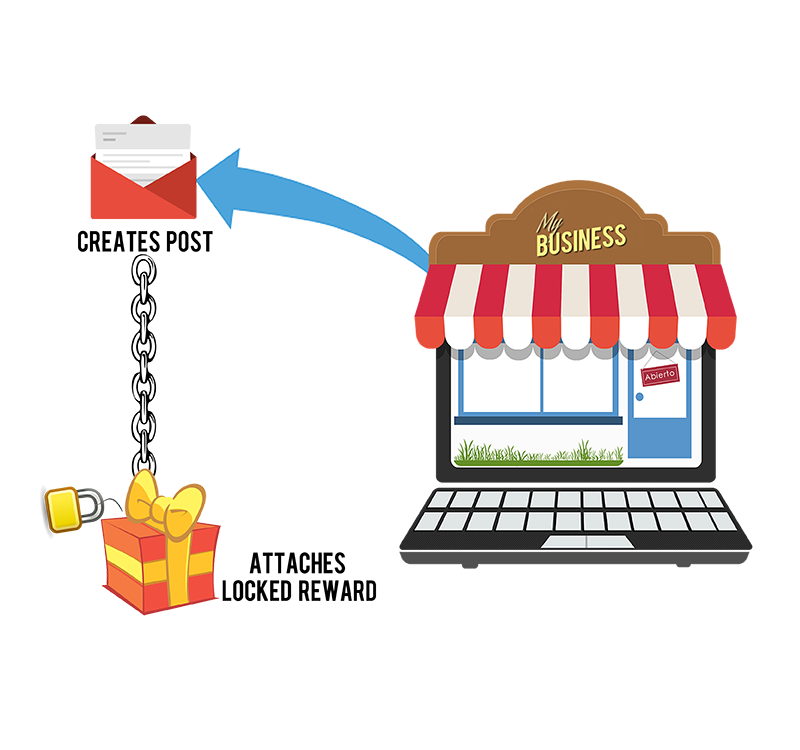 Consumers can UNLOCK the reward by engaging with your post. Beyond Digital: also use physical touchpoints to encourage in-store consumers to be ambassadors and motivate their friends to engage with products or services online. Our "Brick-to-Click" marketing strategy bridges the gap between physical and digital retail spaces to increase online activity and sales. A Touchpoint is simply any point of contact between a buyer and seller. With Grabbr, you can launch your marketing campaign directly in front of buyers with any of our Touchpoints including email, text message, website integration, on hundreds of Social Media sites, Bluetooth Beacons, in-store Kiosks, shelf-talkers, event ink-stampers, and much more. MIT, the winner of the DARPA challenge, subsequently determined that "The key to mobilizing large numbers of people is incentives." Read the article Searching for balloons in a social network on the MIT website for details about the study, the methodology behind the winning strategy, and insights about mobilizing people networks through a strategy of recursive incentivization. "We live in this web of social relationships, and a lot of what we do and the satisfaction we derive comes from the web of social relationships. So if you want to get people to coordinate or change their behavior, you have to first and foremost deal with the existing web of relationships, rather than treat people as isolated individuals." and your brand can have a private label marketing platform with full reseller capability. What Happens When A Consumer Clicks On Your Campaign? The Process Repeats As It is Shared Creating The Potential For A Viral Message. Our Grabbr Reveal will show the social channels where you may want to spend more time growing fans, and which channels are the most engaged. As recent history shows, there is now more than ever a need to "Trust But Verify" the data, metrics, and analytics provided by social platforms and digital marketing campaigns. Campaign Blockchain is designed to create an immutable ledger that validates the connections between what is shared organically and the actions and behaviors of those who engage with what is shared recursively down their social pipelines. Campaign Blockchain will help identify and analyze data from the most valuable "social chains" generated by your campaign activity. Volume and transactional pricing for large scale initiatives. 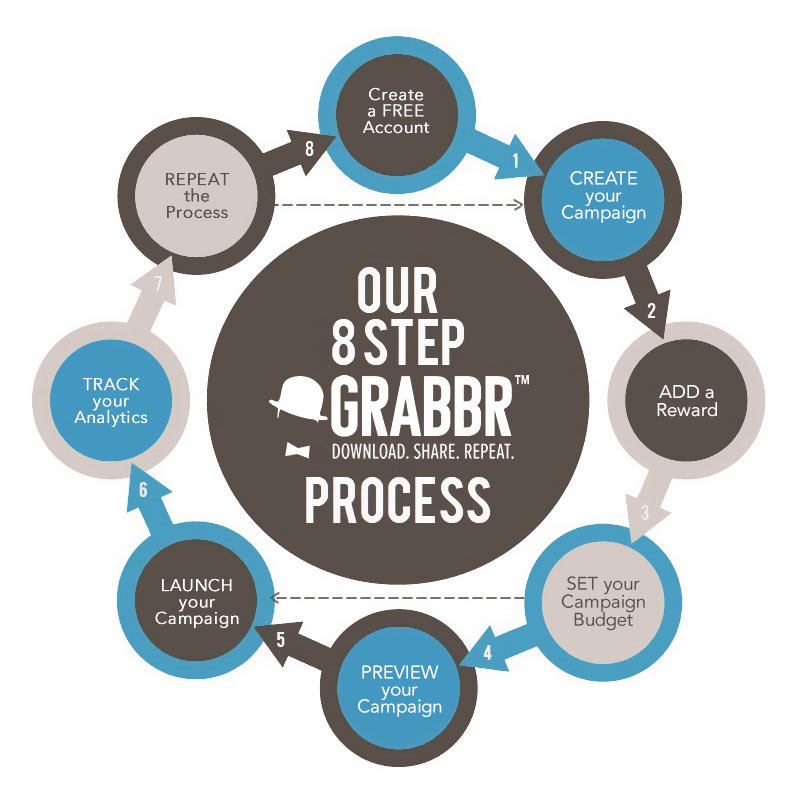 All Campaigns are built on Grabbr's Pay-Per-Share model which means you only pay for results. Physical touchpoints such as beacons are sold separately for each account. Our in store kiosks are meant for organizations with more than 20 brick and mortar locations. Grabbr offers Service & Support Plans, plus in-house marketing and social media plans. "Grabbr's social expertise and simple user experience has slingshot the SkyRunner product in front of hundreds-of-thousands of new, engaged fans. One simple campaign on their platform facilitated our video being shared to over a quarter of a million people through social media, text, and email. Even celebrities shared through the Grabbr platform to enter to win a day of flying and off-roading in our adventure vehicle. Organic marketing like this works plain and simple...Daniel (and the Grabbr Team) — Thank you for delivering on what I can only describe as the booster rocket of our launch! On behalf of SkyRunner and myself, we are forever grateful!!!" "One of the biggest challenges for a Publisher or Author is to get enough impressions for a book to actually motivate a buying behavior and BookGrabbr facilitates that!" "It is a challenge finding marketing platforms that are both reader and author centric. We are always looking for platforms that offer measurable results for an economical price. That is why we are so excited to be working with BookGrabbr." "Grabbr is awesome for everyone in the Fitness Industry who wants to know the true value of their Social Media Fans. Before Lou Ferrigno and I started using Grabbr to promote Ferrigno Fit products we never really knew to what extent they were engaging with us. Now, as we launch the Ferrigno Fit Box, Grabbr helps us organically distribute the offer to our fans and customers. Grabbr has taken all the guesswork out of our marketing campaigns and is helping us to completely redefine our strategies when connecting with our fans. After seeing what Grabbr does, I personally feel that all fitness companies, no matter how large or small can greatly benefit from a Grabbr Account." "What a great platform! We uploaded a vocal-warm up exercise video to our reward locker and shared to our email list and social media. Within 5 days Grabbr facilitated a 1,100% increase in organic traffic! 5 countries worth of people had shared in exchange for our warm up video!" 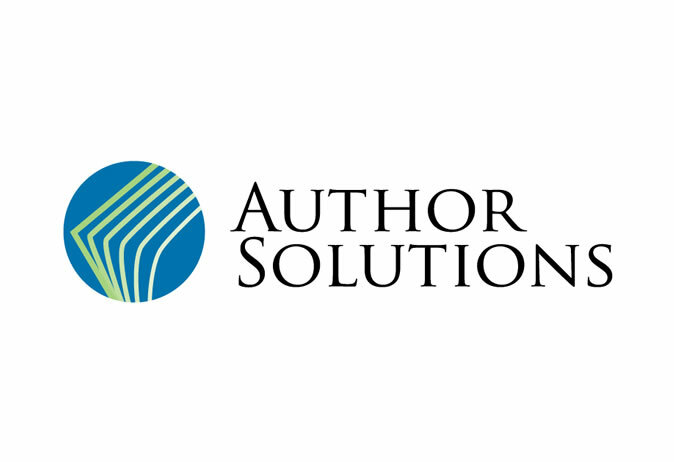 One of the largest facilitators of publishing books for self-published authors in the world. Had no opportunity to offer their authors a marketing service that provided analytics with trackable results. Became a reseller for Grabbr and has been reselling to their authors for over a year with zero refunds to date. 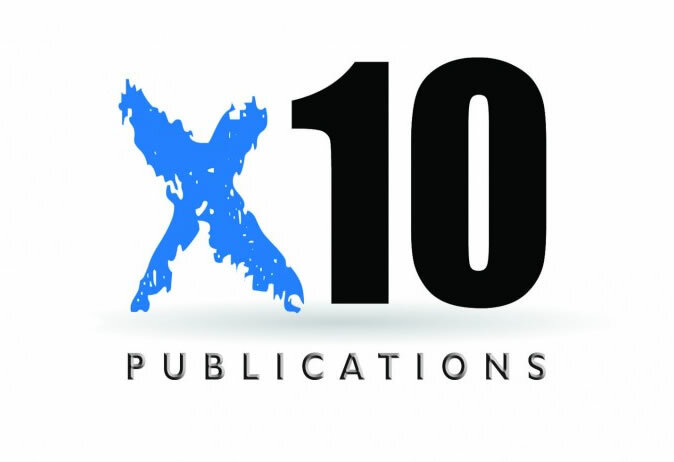 Boutique publishing company that produces 6-10 titles yearly. Spent over $7,000 on Facebook ads and other social ads with almost no return on investment and limited tracking in 2015. Started using BookGrabbr and have experienced more sales and trackable results at a fraction of the cost spent on marketing on Facebook and other social sites. Organic facilitation of distribution of content generated readers in 36 countries for their authors. An imprint of one of the largest publishing companies in the world. 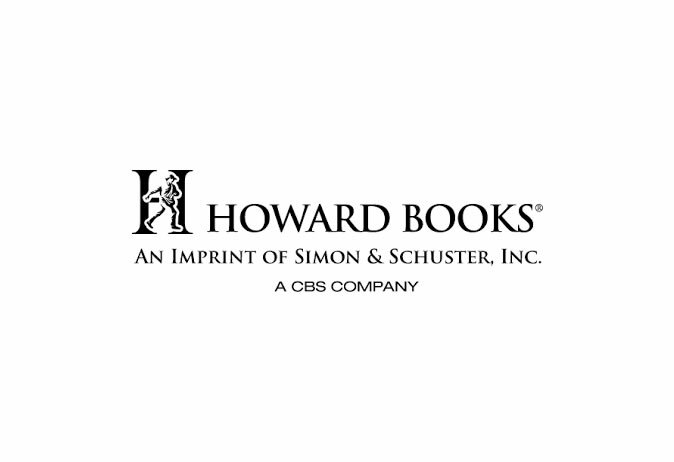 Howard Books was looking for a new and innovative way to push pre-orders on upcoming books. Author Sarah Bessey shared a preview of her book only once on Facebook and Twitter. BookGrabbr facilitated readers sharing in 23 countries within 2 days which resulted in an immediate lift in sales. 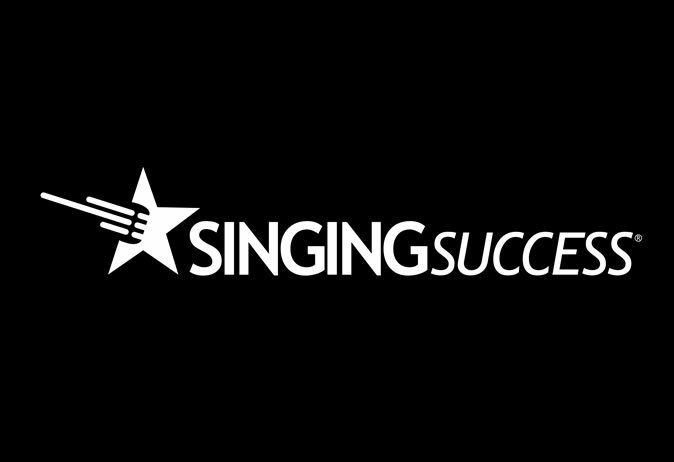 A highly esteemed voice coach and singing curriculum known around the world. Didn’t know how to measure the ROI of social media activities and in need of a social marketing tool. After running a few campaigns on Grabbr they found that they needed to spend more money on building their email list and engaging fans on 2 social sites that they weren’t currently heavily utilizing. Grabbr facilitated a 430% increase in organic activity on their social channels. 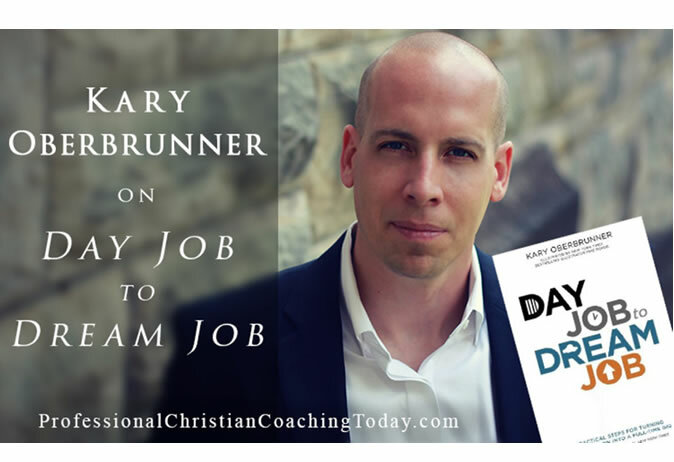 Bestselling author, business coach, and speaker. Kary attached his book to his reward locker and set a cap on how many people would have access to it in exchange for sharing his message. He saw a 660% increase in organic traffic and sharing across 4 social platforms. His messaged was shared to over 200k people. This resulted in a lift in sales on his book and an increase in exposure on his coaching brand. 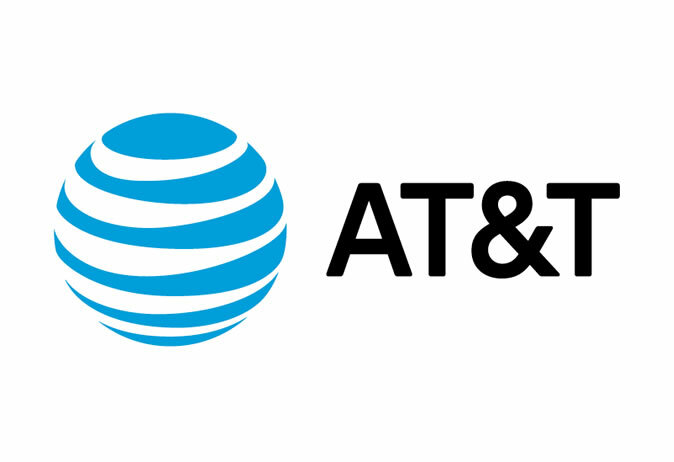 The world's second largest telecommunications company. Looking for opportunities to get more organic engagement on their social posts. Grabbr facilitated an average of 480% increase in traffic for the engagement on their social posts. They sparked a campaign on Facebook that over doubled activity and growth on Twitter. Grabbr now offers a Private Label Solution for Large Organizations. Let's connect to discuss how Grabbr can help your organization implement a new growth hacking strategy.